A few weeks ago I got an unexpected surprise – a snow week! Maybe the best thing about working at a university is snow days as an adult, and a whole week was something new. I used the time to organize the basement a bit. When I first started making space to do some woodworking in our basement, I put up some OSB I had laying around from roofing our porch and mounted tools to it with random screws and nails. It was a big step up from having everything laying around, but as I get more tools and understand what I use more often, I wished it was easier to move things around. In the other corner, I had an old wire rack that I was using to store some of my other tools. It was messy, and really hard to keep organized since it was basically just semi-organized piles. Behind it was the end of some storage shelves that I built a while ago. 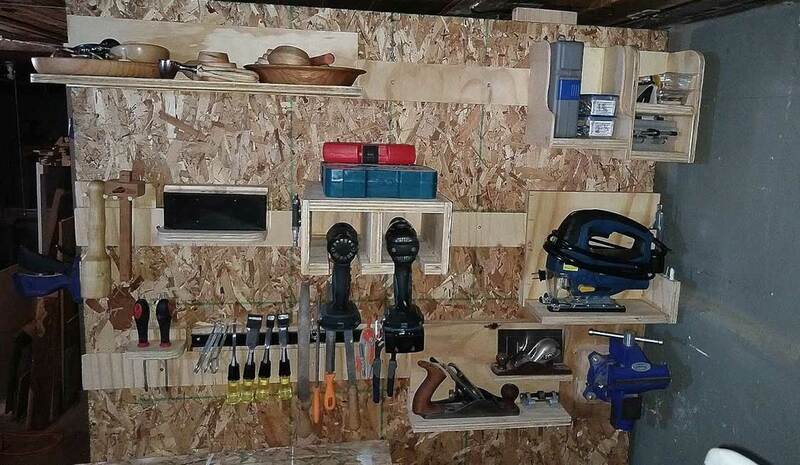 The ends were two 2×6’s so I decided to put up a storage wall there as well but wanted to try using french cleats. The genius of this is it is really strong if you build the tool holder correctly (more on that later), but it’s still easy to rearrange if like me, you are adding to your tools as you go. There are lots of good videos about making them on youtube, I checked out a couple for ideas before I started. The one thing I learned (a little too late) is that you have to be careful about providing enough vertical support under the cleat on the tool holder that the weight doesn’t pull it forward. This is easy to do by just putting a 3/4″ strip at the bottom of anything that is a little taller. The only holder that I might have an issue with is the drill holder. 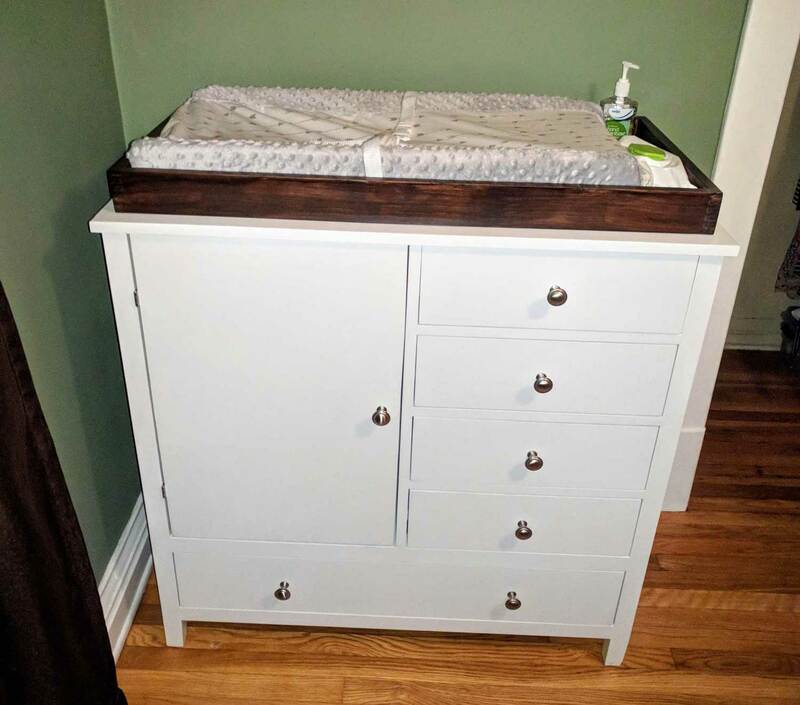 It wasn’t tall enough to add any support underneath, and I knocked it out once by bumping it when building the holders. I think it will be okay, but for the others, like the jigsaw, I added a strip to the bottom and it is rock solid. All in all a fun and productive way to spend some unexpected free time. I also got a mobile tool base kit from Harbor Freight for my table saw and built that with some leftover pallet wood I had laying around. Moving the saw is about 100 times easier now, I didn’t realize what a pain it was before. I repurposed the wire rack to organize some of my wood, although I think a rolling lumber cart might be my next bigger project. A few months ago I picked up a hand plane at an antique shop we had stopped at on our vacation. 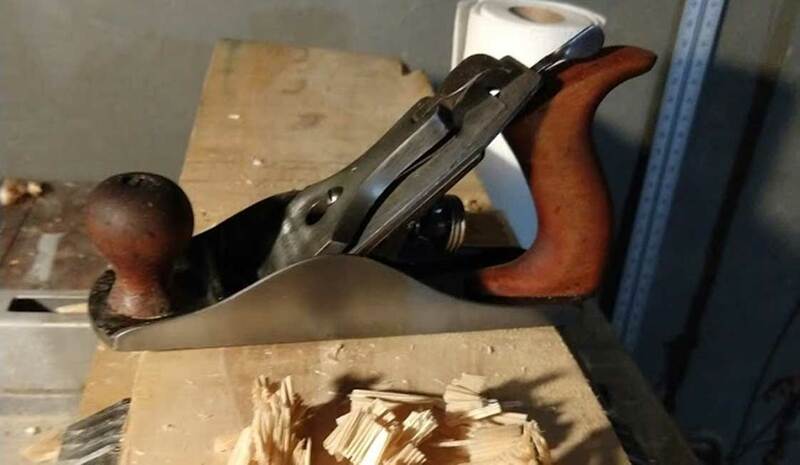 I had been keeping an eye out for one since I was looking to get into woodworking a little more. Supposedly, old planes are just as good as new ones once they get restored, and the restoration process seemed simple enough. Long story short, it went really well, and I get why people are obsessed with these things. The coolest part, is I posted online asking if anyone could identify it. Since it didn’t have any branding on it I couldn’t tell and was curious how old it was. Thankfully, the internet can be a neat place and someone was able to tell me they were pretty sure it was most likely make somewhere between 1902-07. Crazy right? Maybe it’s because most of the things I make day to day are websites the get stale after a year or two and become useless after about five, but it’s really interesting to think that I am using something someone made over 100 years ago.